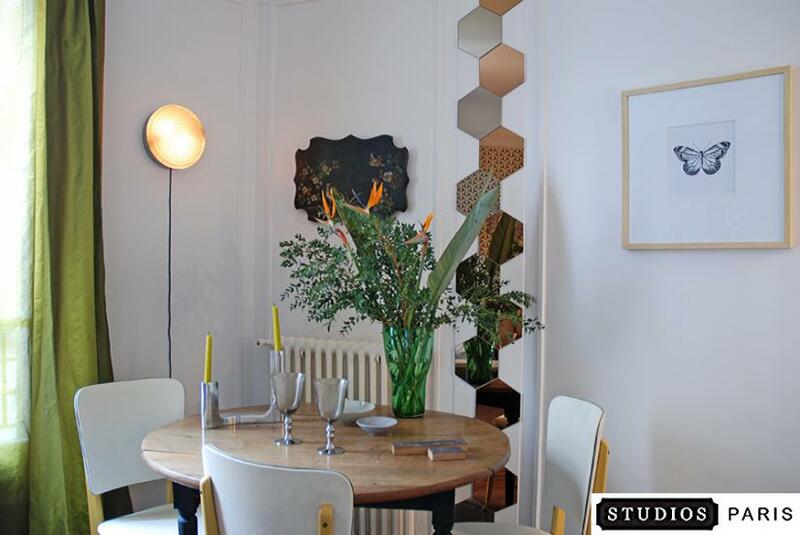 British wallpapers, an authentic Champs Elysées theatre poster and vintage 70s chairs all come to life in the lively pastiche of Play-Back, Les Studios’ latest original apartment renovation project. With a team of experienced designers, headed by senior designer JC Peyrieux, our architecture department is here to prove that “impossible is nothing” when creating a dream world tailored to suit your fancy. Completed in January 2013, Play-Back is Les Studios’ latest artistic renovation project. 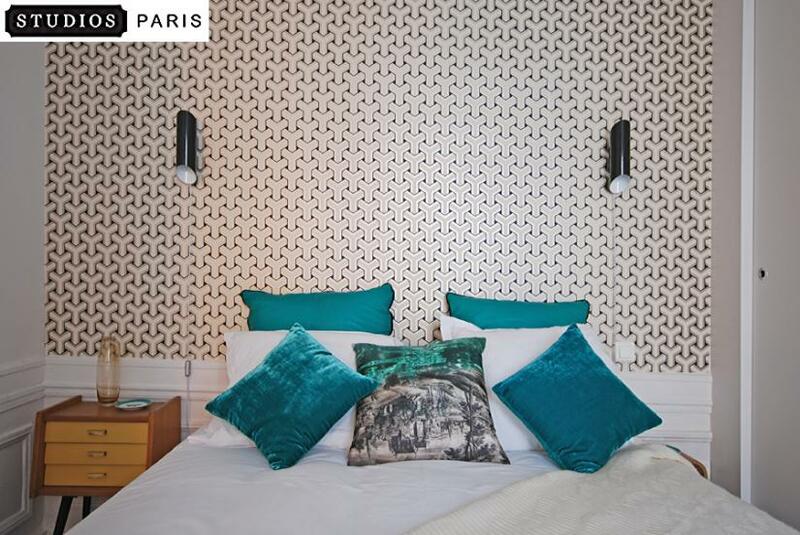 Fully revamped and decorated by Les Studios’ team of inspired designers, this bright and quiet one bedroom apartment will comfortably host 3 to 4 guests. Sophisticated, fancy and homely, Play-Back is a successful blend of vintage elements efficiently integrated into a contemporary design setting. Its toned and subdued colour palette inspires warmth and comfort and creates a genuinely intimate atmosphere. In tune with 2013’s major interior design trend, Play-Back features many handmade or creatively repurposed objects and materials. Those state-of-the-art items stand out and bring a fresh touch to its vibrant yet graceful design. With its revamped old chairs and hand-made leather cushions, the Play-Back project takes creativity to the next level. Balanced by a natural look, the space’s organic modernism is the ultimate proof that Comfort is the hottest trend this season. Provided with a fully equipped kitchen, a living room with a TV with international channels and high speed Internet, the flat has a bright and spacious master bedroom with an en-suite shower room, a large dressing cabinet and a cozy office corner for your musings by the window. 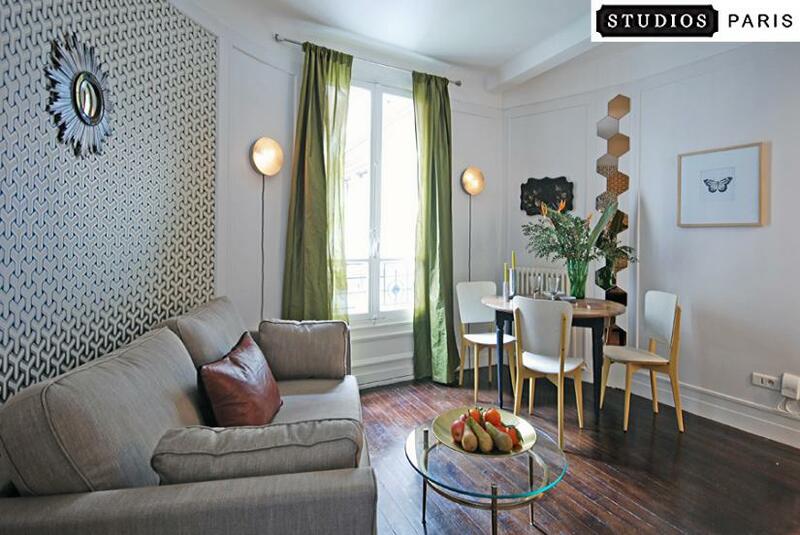 Located at the heart of romantic Montmartre, right next to the unique vineyards and the Sacré-Coeur Basilica, it is only a few metro stops away from the city center and the major Parisian touristic spots. Play-back’s creator and senior designer at Les Studios, JC Peyrieux, talks Inspiration and Decision-making during the flat’s renovation process. Does “Play-Back” belong to a certain interior design style?Rather than employing a “whole design” approach, lately I’ve been attracted by apartments furnished with selections of items subject to individual liking. That could be pieces you bought or inherited, items that used to be your friends’ or parents’, things that just stroke your fancy. In Play-Back each piece of furniture has been chosen independently, without necessarily belonging to the style of the rest. We want to be encircled by furniture or accessories which mean something, which make us smile and ultimately transform our place into a home. 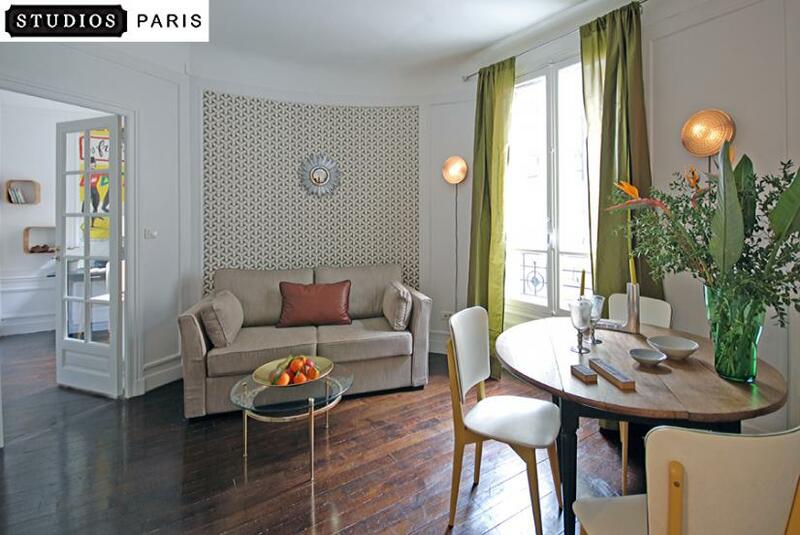 Basically, if your apartment is furnished only with objects you like, who cares if they are the same style or not? How did you choose the “look / feel” of Play-back? I like the 50s-70s mix of it all, with a modern/classy all-round atmosphere. The apartment has a certain elegance with its dark wooden floor and wooden frames on the wall, which I used to define the wall paper panels. To sum up, I wanted this place to look like someone’s apartment instead of a designer’s product. The owner gave me “carte blanche”, which in general gives me wings to create something original and personal. How did the decoration process unfold? I did not have a big budget and wanted to make something interesting so I bought all the furniture cheap from flea markets and “Le bon coin”. I have sanded, repainted and repaired them all. They form quite an odd bunch – a “country style” oak table, repainted 70s chairs, a 1940’s desk, a 70s bedside table. The English brand wallpaper “Osborne & Little” was used as a stylish addition meant to make a strong statement and add some “relief” to the bedroom. 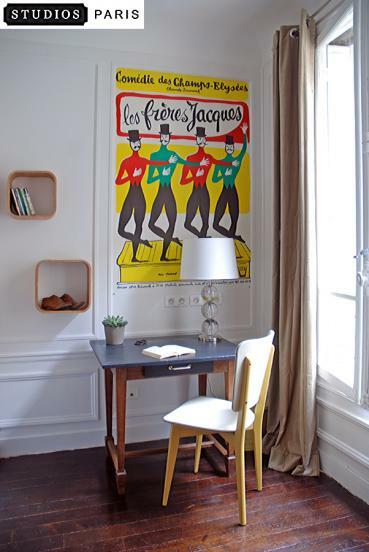 The “Frères Jacques” poster which was applied as a wallpaper in the tiny but cozy office corner, is a vintage print from the “Théâtre des Champs Elysées”. The colors matched perfectly with the green cushions. I made the leather cushions myself from leather panels I’d bought in Paris. I used some IKEA accessories (vases, mosaic mirrors, picture frames) and chose a few fabrics at ZARA HOME. As a final point, Play-back is the practical example that you can achieve more with less. Who is Play-Back intended for? What do you like best about Play-Back’s new look? I like the wallpaper and the mix of “earthy colours” – khaki, mustard, sand, dark wood and marble all add character and a homely feeling to the apartment. The kitchen is tiny, yet perfectly equipped. We managed to put everything in – oven, microwave, fridge, dishwasher and all appliances. The great thing with this 38 sq. m. apartment is that it has all the features of a much larger flat – a proper entrance, a separate kitchen, a separate WC with sink, a lounge and dining area, a master bedroom with an en-suite bathroom, walk-in shower, storage, large dressing cabinets and even a tiny office space. My favorite room is the bedroom – I purchased the wall lights cheap at Castorama and adapted them to have a wire and switch on its side. I like the touch of bright green and yellow that jazzes up the classiness of the wall paper. To have your apartment designed /renovated by us, please contact us. We’re a bunch of volunteers and starting a brand new scheme in our community. Your web site provided us with helpful info to work on. You have performed an impressive process and our entire group can be thankful to you.